For a long time claims have been made of plasma eyelid lift treatments to be a substitute to blepahroplasty. As we have seen this is not the case in many instances and sometimes for several reasons. In this page we will be discussing the healing process of a blepharoplasty and compare it with the healing porcess of plasma eyelid lift in order to understand the differences. In this way the reader will have an understanding of the advantages and disadvantages of each procedure also in terms of healing process. This will help the reader build the foundations required in order to advise clients appropriately when suggesting one procedure versus the other . In this way the reader will gain a clear understanding of the pros and cons of the two types of procedures and will be able to advise their clients in the best possible way. 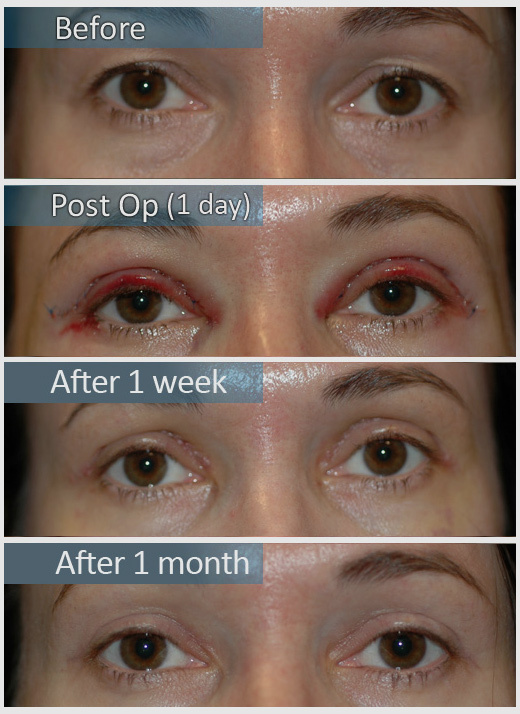 Eyelid surgery (blepharoplasty), like all surgery, involves a period of recovery following the procedure. The eyes may tear excessively. Feeling of dryness in the Eyes. Difficulty in shutting the eyelids in certain instances. Overall prolonged numbness of the eyelid area. Over sensitivity to the light. 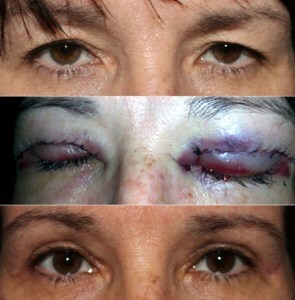 Picture showing the main stages of a blepharoplasty healing process. Initially, patients can expect redness and swelling around the incision areas. The eyes may tear excessively. Any dryness that occurs in the eye area can be alleviated by ointment that the surgeon can provide. However, patients may experience a temporary blurring of vision as a result of using the ointment. In general, temporary blurred vision is one of the common side effects of eyelid surgery. Recovery may also include temporary sensitivity to light. In the vast majority of cases, the short-term healing is over within 10 days following the procedure. However the area will be subject to change over the several following weeks and months. The vast majority of the change will occur over the month following surgery. 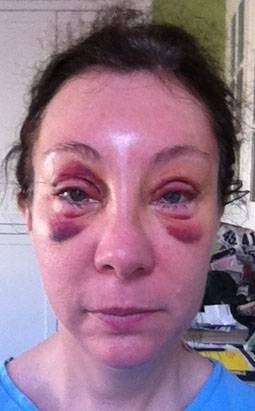 As we can see one week after the procedure is still a minor amount of swelling witch cannot be observed one month after surgery. The swelling and bruising usually peaks on the third day after the procedure, he area starts to improve start from the third day onward. Sutures are required during surgery and cannot be avoided. They are usually removed 7 days after the procedure. In case or absorb-able stitches the sutures will fall off on their own. Example of what the area looks like immediately after the procedure.. The stitches are clearly visible. No swelling or bruising is present. Stitching and bruising start developing progressively a few hours after the treatment. 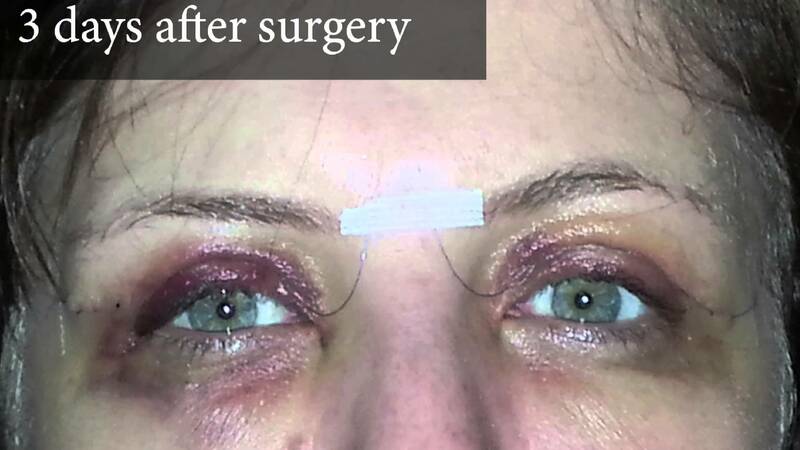 Lower and upper blepharoplasty. 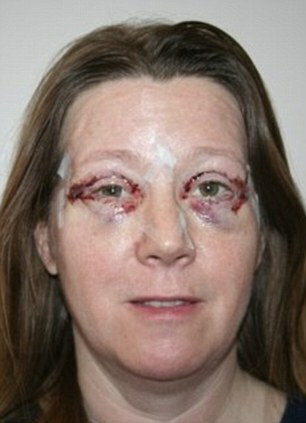 It is usual for patients to have bruising following blepharoplasty surgery. 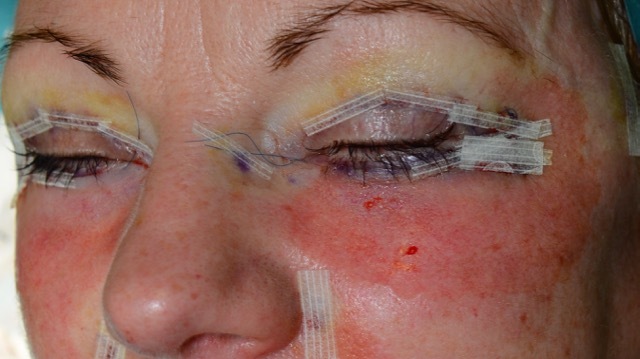 The bruising sustained after eyelid surgery depends on the extent of the surgery. In general, the bruising resolves fairly quickly within 7 to 10 days. The purple discoloration will turn yellow and then slowly fade away over time. In rare cases, bruising may last for up to 4 to 6 weeks following surgery. Most bruising resolves in about a week, but residual bruising can last for several weeks depending on your rate of healing. Refrain from exercise and heavy lifting for at least a week after surgery for minimal bruising. You can also cover it up a bit with concealer after your stitches have been removed (in about a week or so). 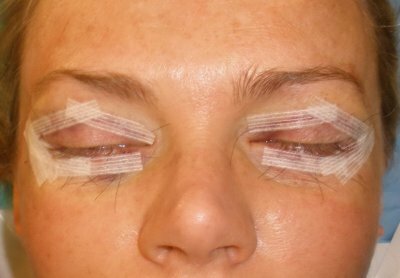 The degree and duration after blepharoplasty varies from patient to patient and technique to technique. Bruising will always go away. A bruise is the result of blood trapped in the tissues under the skin. Over time, this blood is broken down and the components reabsorbed into your system. The swelling from eyelid surgery can take several months to completely resolve. The skin around the eyes is very fine. You will see changes in the swelling with improvement around your eyes for the whole first year after surgery. can persist, depending on what was done during your procedure. If you had fat removed due to your ethnic eyes, the swelling can last for long periods of time. Elevation is the simplest thing you can do at this point. Give it time and it will diminish. What you are experiencing is, in all likelihood, normal. Swelling that comes with reclining and goes away a while after you get up is usually not a dangerous situation, although it is always helpful to check in with your doctor to be sure. Particularly in the head and face, when we lie down, we lose the effect that gravity provides in the upright position- gravity pulls any excess fluid down, which is why you might notice that your feet may swell during the day but be better in the morning. The fluid that gravity causes to flow down to your trunk and to your legs gets re-distributed when you lay down, and all of your body parts, including your head, are at the same vertical level. Areas that have recently had surgery are more susceptible to swelling because the healing process may allow fluid to accumulate more in areas where the blood vessels and other drainage vessels are still regenerating. This is the reason that we often ask patients to elevate the head of their bed at night- to keep the head and face at a higher level than the rest of the body, so gravity can help us with the swelling. It's not unusual for patients undergoing blepharoplasty to have prolonged swelling. This swelling is often related to the magnitude of the procedure and is more common when fat pads are removed. Most patients will note significant swelling for about two weeks following surgery. After two weeks, most patients are comfortable resuming their normal lives and going out in public. Blepharoplasty, or eyelid surgery, can create dramatic anti-aging effects for the right patient. Still, like any facial cosmetic surgery, the procedure is followed by downtime and recovery in order to allow the delicate area to heal properly. As a blepharoplasty patient, you’ll struggle to see your results in the early days of healing, thanks to the moderate to significant swelling you will likely experience. This will eventually subside, but there are steps you can take to ease your discomfort and move the process along. WHY DOES SWELLING HAPPEN AFTER SURGERY? Although it should be treated appropriately, swelling is certainly not an unusual reaction to surgery. In fact, it is the body’s natural response to any injury to the skin, tissue, etc. Surgery intrudes on the body and the body reacts accordingly. Swelling is a method of cushioning the affected area with fluid in order to aid recovery. As the area heals, the fluid will lessen and the swelling will go down. There are several keys to ensuring your healing process moves forward and your swelling is reduced. Most importantly, you should follow your facial plastic surgeon’s advice for a smooth recovery. HOW DOES BLEPHAROPLASTY CAUSE SWELLING? Eyelid surgery does involve the placement of incisions along the creases of the upper and/or lower eyelid in order to make the necessary changes. Patients seeking this procedure often suffer from excess loose skin on the eyelids, accumulated fat cells, and the effects of aging. Through blepharoplasty, your facial plastic surgeon will remove the excess fat and skin, reducing puffiness and sagging, and creating a more youthful appearance for the eyes. Swelling can result from this procedure as the body adjusts to the incisions and the changes your surgeon has made. Caring for the incisions and the area around the eyes, as well as yourself, can help to reduce the swelling and ensure the recovery process goes smoothly. How Can I Encourage Healing and Reduce Swelling? Avoid strenuous activity and vigorous exercise until you are clear to resume them. Eat healthy food and drink enough water to stay hydrated. Your body will need resources to recover well. Pain management, especially with anti-inflammatory drugs, can keep the swelling manageable and help you rest. Keep your head elevated to reduce blood flow to the areas around the eyes, which can reduce swelling. Apply cold compresses to the surgical area, only if advised by your facial plastic surgeon. Your facial plastic surgeon may offer additional advice and tips on how to heal quickly enough to reduce your swelling at a reasonable pace. Also remember to stay positive as you recover. Keeping your spirits up and avoiding stress can allow the body to do what is necessary to heal fully. 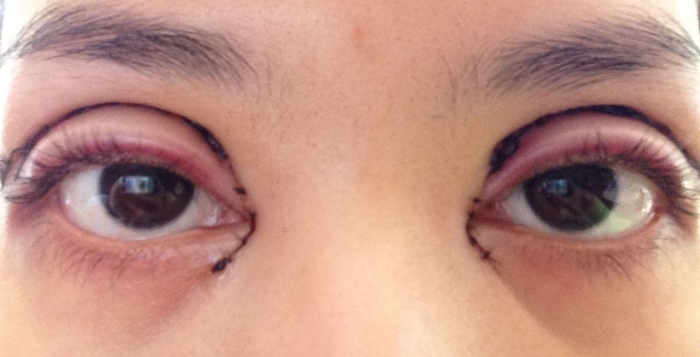 HOW LONG WILL SWELLING LAST AFTER EYELID SURGERY? Swelling will begin almost right away, so you should expect to feel the pressure and some discomfort immediately after you wake up. You won’t be allowed to drive home from your surgery, so arrange for a friend or family member to bring you in and drive you home safely. Your swelling will get worse before it starts to get better, so don’t be alarmed if the area feels puffier for the first couple of days. After that, you will notice the swelling starts to recede gradually, every day a little bit more. By the end of your second week, 80 percent of your swelling will be gone. That last 20 percent can hang around for a few more weeks but should be completely gone within two to three months. If you ever have concerns about your swelling or healing process, contact your facial plastic surgeon’s office for the best advice. WHERE CAN I SCHEDULE EYELID SURGERY? If you’ve been frustrated with the signs of aging around your eyes, including sagging eyelids, puffiness, and excess skin, you may be eligible for blepharoplasty surgery. To plan your procedure, start with a consultation at The Glasgold Group,where your health, safety, and satisfaction are a top priority. A family practice, The Glasgold Group was founded over 30 years ago by Dr. Alvin Glasgold. His sons, Dr. Robert Glasgold and Dr. Mark Glasgold, carry on the family legacy as board certified Facial Plastic Surgeons in central New Jersey. Dr. Robert Glasgold offers patients expert knowledge in his specialty areas in aesthetic facial plastic surgery, especially in blepharoplasty, rhinoplasty, and total facial rejuvenation. Dr. Mark Glasgold focuses on the complete rejuvenation of the aging face, specifically facelifts, eyelid surgeries, and more. Book a consultation with the Glasgold Group, located at 31 River Road in Highland Park, New Jersey, by calling (732) 846-6540 today. Maximum swelling is usually at about 3-5 days and goes away over a few months. You should sleep with your head elevated and cut back on salt to help the swelling. While swelling after any surgery is of course normal, it would be best to see your doctor to make sure you have not developed an infection in the operated area. It is a bit unusual to see significant swelling in the face a week after a simple blepharoplasty. If there is no evidence of an infection, he may recommend warm or cool compresses and elevation of the head at nighttime. You may also want to discuss with him your activity level (i.e. working out), which can worsen early postoperative swelling. With rare exceptions, swelling caused by eyelid surgery resolves in time. Four weeks after a surgery is actually considered to be relatively soon after surgery. This means that the swelling you are experiencing will get better in time. 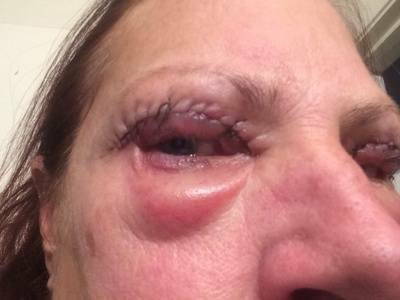 The rare circumstances where swelling lingers can be related to surgical disruption to the eyelid lymphatics but even this type of swelling resolves eventually. However, there other causes of fullness following eyelid surgery that are unrelated to tissue swelling. This can include fullness from tissue that can become heaped or wadded with surgery. This can be seen for example after fat transfer to the lower eyelid. You indicate that your surgeon straighten out muscle in the eyelid. Again this might heal in such a way that the eyelid contour is not even or smooth and initially is seen with tissue swelling as general fullness. These types of issues generally benefit from 6 to 12 months of healing and whatever has not fully resolved at the point may need to be addressed with revisional surgery. Finally, ask yourself if what is concerning you is your confidence in your surgeon or the office. Sometime offices (and their doctors) don't give patients the opportunity to voice their concerns about the surgical results. The doctor or staff know that almost everything gets better in time and the goal is simply to give you time for that recovery. However, they still need to listen to your concerns. Often second opinion in this time frame are not very productive for the simple reason that what is needed is time. However, if you are truly concerned and feel that your concerns are not being addressed, a second opinion may be useful. After upper and lower blepharoplasty surgery, the eyelids typically feel tight; accompanying soreness may be treated with analgesics. For the first couple of days following the surgery, the incisions should be treated with ointment to keep them lubricated. Cold compresses can be placed on the eyes to reduce swelling as well. Eye drops will be necessary to help keep the eyes from drying out. In the first week after the procedure, patients should avoid any activities that may dry up the eyes, including reading, watching television, wearing contacts, and using a computer. Swelling and bruising can be minimized by keeping the head elevated as much as possible during the first few days of recovery. The doctor will remove the stitches between two and seven days after the eyelid surgery procedure. Patients may feel well enough to resume normal activities around the tenth day of recovery. For the first couple of weeks following the surgery, dark sunglasses are recommended to protect the eyes from irritation caused by the sun and wind. Patients may notice that their eyes tire easily for the first several weeks of the recovery period; frequent naps are recommended. Throughout the first three to four weeks after the surgery, any activities that increase blood flow to the eyes should be avoided, including bending, lifting, sporting activities, and even crying. Patients will be informed by their physicians when any type of exercise regimen can be resumed. 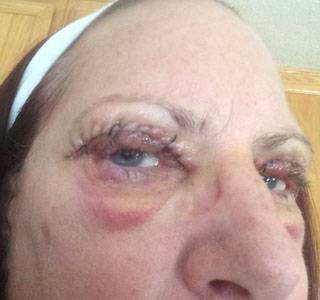 Recovery from eyelid surgery generally takes several weeks. Within two days to a week, the stitches will be removed. In the first week, patients will want to make sure that their eyes receive plenty of rest. The redness and swelling occurring after the blepharoplasty procedure will fade with time. Recovery will also include ensuring that any exertion that may increase blood flow to the eyes is avoided. Patients may be able to return to work approximately 10 days after the surgery. For some, the recovery process can seem long and they may become depressed, especially in the early stages of recovery when their faces appear swollen and bruised. But after a few weeks most patients begin to notice a welcome change in their appearance. The results of eyelid surgery – eyes that look younger and more alert – remind patients why they chose to undergo the procedure in the first place.